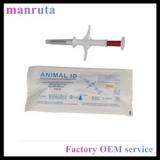 MRT007 is a kind of syringe that designed exclusively for animals. It contains a disposable syringe, a parylene coating microchip, 15 one-dimensional bar code spans and a sterilized paper-plastic packing pouch. MRT007 meets all international standards of animal identification (ISO 11784/ISO 11785). Each syringe is produced using top quality European chips with read/write capability and features unique data security. 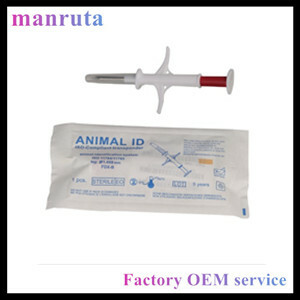 Coupled with Manruta Tech reader series, MRT007 provides a beneficial solution in animal breeding, slaughter management and animal identification.